The Institute for Critical Education Studies is please to sponsor two upcoming seminars on curriculum issues in Latin America and Spain. Panelists include Dr. Renato Gazmuri (Universidad Diego Portales, Chile); Sandra Delgado (Colombia), Fernando M. Murillo (Chile), Breo Tosar (Spain), and Héctor Gómez (Chile). Renato Gazmuri, PhD, Assistant Professor at Universidad Diego Portales (Chile). Dr. Gazmuri will discuss his research on the construction of the social studies curriculum in Chile. The Chilean social studies curriculum has been defined through processes of discussion and negotiation between diverse actors and institutions with different views on the subject. In order to identify and describe these ideologies, a sequential and recursive methodological device was designed and applied in three stages of production and analysis of information: a documentary compilation around three curricular events of debate and negotiation, application of questionnaires, and interviews. At each stage a content analysis was performed. Five curriculum ideologies are identified and described, considering their assumptions about how the curriculum should define the subject matter, as well what its aims, contents and its guidelines for teaching. These seminars are free and open to the public. The Institute for Critical Education Studies (ICES) was formally established in October 2010 to conduct and support cultural, educational, or social research within a critical education or critical pedagogy tradition. The ICES network consists of two flagship journals (Critical Education and Workplace: A Journal for Academic Labor), two primary blogs (ICES blog and Workplace blog) and an array of other social media. It’s report card season. Just how useful are report cards? How should parents respond to their students grades? What kind of questions can or should parents ask teachers about the assessment of their students’ performance? Should parents reward their students for good grades? Sandra Mathison, an expert on evaluation and co-director of Institute for Critical Education Studies, offers advice on these and other issues in the UBC News Experts Spotlight. Listen to the podcast of Dr. Mathison’s comments on CBC’s On the Coast, with Stephen Quinn. Table of Contents here and then visit our web site to read articles and other items of interest. 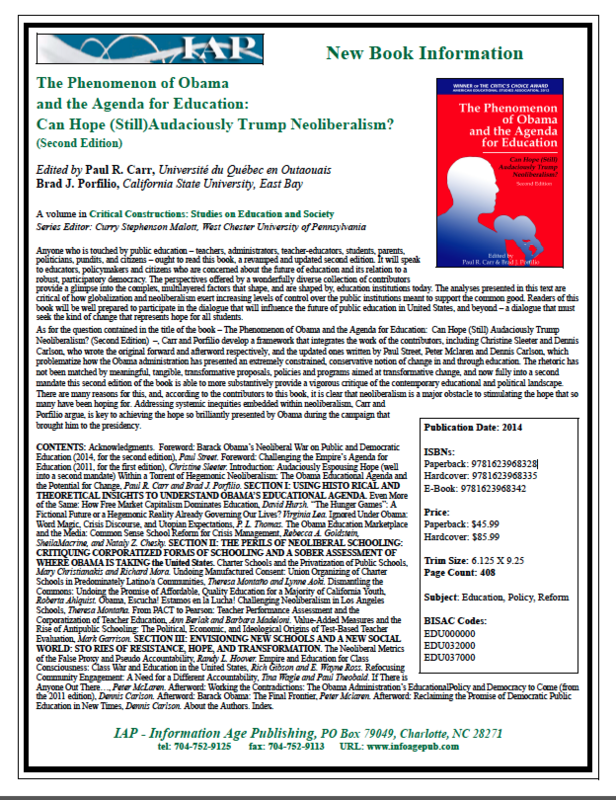 In this article, I direct an anthropological lens to the state’s university campuses and to the discursive construction and marketing, as well as the accommodation, negotiation, and contestation of the state’s controversial legislation around diversity education and guns. Focusing on tertiary education, I examine both the ways that the rhetoric of liberalism, that of constitutional rights, the nation state, and individualism in particular, has been employed to package and sell the state’s anti-Ethnic Studies and pro-gun initiatives, and the discursive struggles in which university communities have been engaged in the attempt to rebut these political incursions. I argue that a liberal discourse has been employed to defend what otherwise might be perceived as discriminatory positions enacted on the state level in Arizona. In this border state, demarcated by ever growing racial and class-based difference, legislation promoting assimilationist pedagogy, and wider gun distribution may be desired, but it is most easily defended when wrapped up in the stars and stripes of liberalism. The question of class size continues to attract the attention of educational policymakers and researchers alike. Australian politicians and their advisers, policy makers and political commentators agree that much of Australia’s increased expenditure on education in the last 30 years has been ‘wasted’ on efforts to reduce class sizes. They conclude that funding is therefore not the problem in Australian education, arguing that extra funding has not led to improved academic results. Many scholars have found serious methodological issues with the existing reviews that make claims for the lack of educational and economic utility in reducing class sizes in schools. Significantly, the research supporting the current policy advice to both state and federal ministers of education is highly selective, and based on limited studies originating from the USA. This comprehensive review of 112 papers from 1979-2014 assesses whether these conclusions about the effect of smaller class sizes still hold. The review draws on a wider range of studies, starting with Australian research, but also includes similar education systems such as England, Canada, New Zealand and non-English speaking countries of Europe. The review assesses the different measures of class size and how they affect the results, and also whether other variables such as teaching methods are taken into account. Findings suggest that smaller class sizes in the first four years of school can have an important and lasting impact on student achievement, especially for children from culturally, linguistically and economically disenfranchised communities. This is particularly true when smaller classes are combined with appropriate teacher pedagogies suited to reduced student numbers. Suggested policy recommendations involve targeted funding for specific lessons and schools, combined with professional development of teachers. These measures may help to address the inequality of schooling and ameliorate the damage done by poverty, violence, inadequate child care and other factors to our children’s learning outcomes. Class size and composition are key issues in the current labour dispute between the British Columbia Teachers Federation and the BC government. In 2002, the ruling BC Liberals unilaterally stripped away provisions in the teachers’ contract that governed the makeup and number of students in each class. The teachers sued the government over their actions, twice. And the teachers won both times. The government is currently appealing their loss and refuses to follow the courts order that class size and composition conditions be restored. The teachers and the government’s negotiators have been at the table for many months, with little or no progress. Last week the BCTF started rotating, district by district one-day strikes around the province. The government responded by cutting teachers pay by 10% and, in a bizarre and confusing move, locking teachers out for 45 minutes before and after school and during lunch and recess. Part 3 of our special series “Teach for America and the Future of Education in the United States”, focuses on altering the trajectory of TFA. Guest editors for the series are Philip E. Kovacs and Kathleen deMarrais.